Objectives: To investigate intramodality and intermodality agreements of CT and MRI erosion volumes in metacarpophalangeal (MCP) joints in rheumatoid arthritis (RA), and to compare the volumes with erosion scores for CT, MRI and radiography. Methods: In total, 17 patients with RA and four healthy controls underwent unilateral CT, MRI and radiography of second to fifth MCP joints in one hand. Erosion volumes (using OSIRIS software) and scores were determined from CT, MRI and radiography (scores only). Results: CT, MRI and radiography detected 77, 62 and 12 erosions, respectively. On CT, the mean erosion volume was 26 mm3 (median 10; range 0 to 248) and 30 mm3 (18; 1 to 163) on MRI. Total erosion volumes (per patient/control) were 97 mm3 (29; 0 to 485) on CT and 90 mm3 (46; 0 to 389) on MRI. For volumes, Spearman correlation coefficients were 0.96 to 0.99 (CT vs CT), 0.95 to 0.98 (MRI vs MRI) and 0.64 to 0.89 (CT vs MRI), all p<0.01. MRI erosion volumes correlated with the Outcome Measures in Rheumatology Clinical Trials/Rheumatoid Arthritis Magnetic Resonance Imaging Score (OMERACT RAMRIS) erosion scores (0.91 to 0.99; p<0.01) and the Sharp/van der Heijde erosion score (0.49 to 0.63; p<0.01). Conclusion: Very high intramodality and high intermodality agreements of CT and MRI erosion volumes were found, encouraging further testing in longitudinal studies. A close correlation with CT and MRI erosion volumes supports the OMERACT RAMRIS erosion score as a valid measure of joint destruction in RA. Quantitative assessment of bone erosion volumes with MRI has been attempted in wrists and metacarpophalangeal (MCP) joints of patients with rheumatoid arthritis (RA),1 2 and is expected to be valuable in documenting changes in joint damage in longitudinal studies. A semiquantitative scoring system, the Outcome Measures in Rheumatology Clinical Trials/Rheumatoid Arthritis Magnetic Resonance Imaging Score (OMERACT RAMRIS) for assessing bone erosions, synovitis and bone oedema in hands and wrists of patients with RA has been developed.3 However, neither determination of erosion volumes by MRI nor the OMERACT RAMRIS erosion score have been sufficiently validated against any external reference. The objectives of this study were (1) to investigate intramodality and intermodality agreement when measuring erosion volumes on CT and MRI in MCP joints in RA, using a semiautomated computerised method; (2) to compare OMERACT RAMRIS erosion scores and Sharp/van der Heijde erosion scores against erosion volumes on CT and MRI; and (3) to determine the sensitivity of MRI and radiography for bone erosions in MCP joints in RA, with CT as reference. Approval from the local ethics committee and informed consent was obtained for the study. In total, 17 patients with RA (4 men, 13 women; median age 52 years, range 33–78; median disease duration 8 years, range 4–22) and four controls, matched for age and gender, were included. All underwent CT, MRI and radiography of the second to fifth MCP joints of one hand. The imaging protocol was performed as previously described.5 Briefly, axial and coronal CT images (voxel size 0.4×0.4×1.0 mm) were created using a multidetector unit (Philips Mx8000IDT; Philips Medical Systems, Cleveland, Ohio, USA). Axial and coronal MR images (voxel size 0.4×0.4×0.4 mm) were reconstructed from coronal T1-weighted 3D fast-field-echo sequences obtained on a 0.6 T MRI unit (Philips Panorama; Philips Medical Systems, Helsinki, Finland). Posterior-anterior and semi-supinated radiographs (resolution 0.3 mm) were obtained with a digital radiography unit (Philips DigitalDiagnost; Philips Medical Systems, Hamburg, Germany). All erosions, detected on CT or MRI, were manually outlined on all coronal images where visible, and the erosion volumes were calculated by OSIRIS imaging software (Digital Imaging Unit, Radiology Department, University Hospitals of Geneva, Switzerland). Volume measurement was performed twice by the same person (UMD) with a 1-week interval between measurements. Sensitivities of MRI and radiography for bone erosions, with CT as reference, were calculated. Reliability of erosion volume measurements was determined by absolute and relative differences, Spearman correlation coefficients and coefficients of variation of the two readings (intramodality agreement). Spearman correlation coefficients were calculated between single (0–10) and persons’ total (0–80) OMERACT RAMRIS erosion scores and corresponding single and total erosion volumes. For intermodality agreement, these measures were repeated for concordant erosions (seen on both CT and MRI). Correlation coefficients between erosion volumes, erosion scores and radiographic erosion scores were calculated. In total, 84 MCP joints were assessed for erosions. All patients had at least one erosion on both CT and MRI, while none was seen in controls. CT detected 77, MRI 62 and radiography 12 erosions. Of 62 erosions found with MRI, 51 (82%) were confirmed with CT, whereas all radiographic erosions were confirmed with CT. Sensitivities of MRI and radiography, with CT as reference, were 66% and 14%, respectively. Total mean OMERACT RAMRIS scores of the MCP joints for all persons were 3.7 (median 3; range 0–14) on CT and 3 (3; 0–11) on MRI–that is, most patients had discernible joint damage (see table 1 for results of volume measurements and agreements). Table 1 Intramodality and intermodality agreements of single erosion and total erosion volume in RA MCP-joints, measured on CT and MRI. Values on intermodality agreement are comparisons between CT and MRI erosions volumes. Spearman correlation coefficient for CT and MRI erosion volumes and their corresponding OMERACT RAMRIS scores of the 21 examined persons were 0.97 and 0.99 (both p<0.01), respectively. If areas with only an OMERACT RAMRIS erosion score ⩾1 were considered, correlations were 0.74 for CT and 0.67 for MRI, both p<0.01. If ⩾2 erosions were present in a joint area, the sum of volumes was used for comparison with OMERACT RAMRIS erosion scores. Total erosion volume per person (n = 21) and the OMERACT RAMRIS erosion score was also closely correlated (ρ = 0.98 for CT, ρ = 0.91 for MRI; both p<0.01). Similar correlations were reached when considering patients (n = 17), all of whom had ⩾1 erosion (ρ = 0.95 for CT, ρ = 0.83 for MRI; both p<0.01). Correlations between radiographic erosion score in the 84 MCP joints and volume of all erosions in the corresponding joint, as measured on CT and MRI, were ρ = 0.52 and ρ = 0.49, respectively; both p<0.01. The sum of the Sharp/van der Heijde erosion scores of the second to fifth MCP joints in all participants (n = 21) correlated with total erosion volumes on CT (ρ = 0.65; p<0.01) and MRI (ρ = 0.63; p<0.01) and with the total OMERACT RAMRIS scores of the second to fifth MCP joints (CT: ρ = 0.65, MRI: ρ = 0.70; both p<0.01). Joints with different scorings on CT and MRI were re-read by three investigators (MØ, BE and UMD) in concert. Repeated assessment of the 11 MRI erosions not detected by CT revealed two disagreements due to misreading of the MRI scans and 4 to misreading of the CT scans. Four MRI erosions were reconfirmed, although still not visible on CT. One erosion, seen on both CT and MRI, was registered differently on the scoring sheets. Of 26 CT erosions not detected on MRI, 8 disagreements were due to misreading of the MRI scans and 6 to misreading of the CT scans. In 12 cases, no changes on MRI corresponding to the CT erosions could be seen (3 caused by poor MRI quality). Of 12 confirmed CT erosions not seen on MRI, even at re-examination, 10 were localised to the phalangeal bases, as were 6 of 8 MRI misreadings. Although high to very high volume agreements were reached between and within imaging methods, respectively, some measurements differed markedly. Obviously, coincidental differences in outlining erosions are a major source of error. In particular, the peripheral border of erosions is difficult to define, as signal intensities of erosions and adjacent soft tissues often are similar on both CT and MRI. In general, the larger the erosion, the more difficult it was to define the border. When comparing erosions on CT and MRI, it must be taken into account that acquisition of images is based on very different imaging techniques. CT is a radiographic method visualising calcified tissue with great contrast to periosseus tissue, whereas MRI is dependent on mobile protons in the tissue, and because water content in bone is very low, cortical bone is depicted as signal voids silhouetted against signal-emitting bone marrow and periosseous tissues. Figure 1 illustrates that bone sclerosis can mimic an area with erosion on MRI, potentially leading to overestimation of erosion size on MRI compared with CT. In contrast, bright signal within an MRI erosion, originating from soft-tissue infiltration, may lead to underestimation of erosion size on MRI compared with CT (figs 1 and 2). However, we could not observe any systematic errors between volumes on CT and MRI. Figure 1 The second MCP joint of a patient with RA on (A–C) T1-weighted MRI and (D–F) CT in (A, D) coronal and (B, C, E, F) transverse planes. (A, D) Black and white dotted lines correspond to the slice position of (B) and (E) and (C) and (F), respectively. On MRI, fatty tissue infiltration of erosions (white arrowheads) may mimic normal trabecular bone (with fat signal from the bone marrow), whereas bone sclerosis, due to lack of signal on MRI, may resemble an erosion (white arrows on (B) and (E)). White arrows on (C) and (F) mark bone erosion visualised by both CT and MRI. 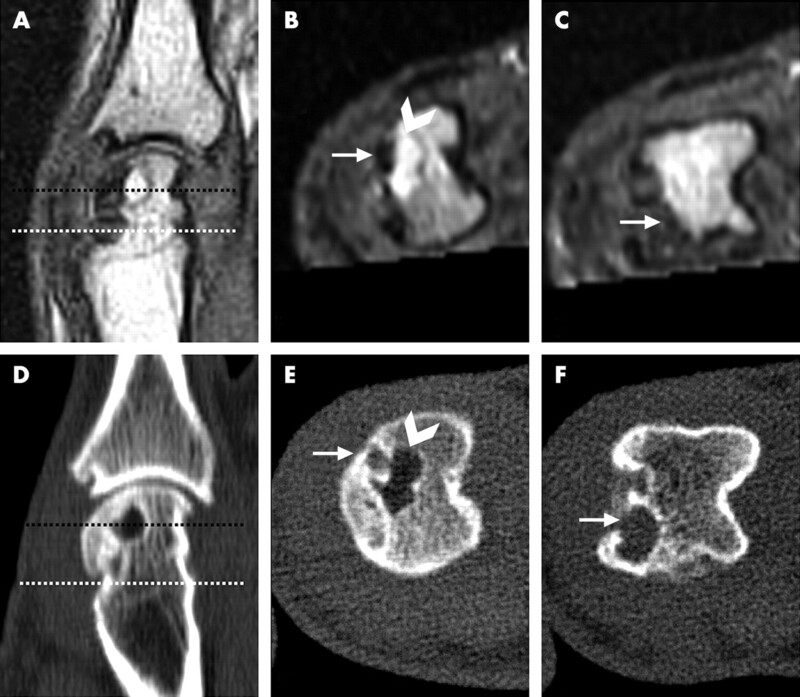 Figure 2 The second MCP joint of a patient with RA on (A–D) T1-weighted MRI and (E–H) CT in the coronal plane. On MRI, a patchy pattern of low to moderate signal intensity is seen in the metacarpal head, resembling large areas of bone oedema with only limited eroded areas (A–D, white arrows). On CT, however, it is clear that a larger area of the bone is eroded (E–H, white arrows), showing that a mixture of erosion and bone oedema may provide a blurred border between them, leading to an underestimation of the erosion volume on MRI compared with CT. The number of erosions detected on CT indicates that CT is very sensitive for detecting bone erosions in MCP joints in RA and possibly is even more sensitive than MRI. Thus, CT may potentially be valuable for detecting and monitoring RA bone erosions. However, the sensitivity to change is not established and the disadvantages of CT include the necessity for ionising radiation and inability to visualise soft tissue. In agreement with previous findings,12–15 a very low sensitivity was found for radiography. After training and calibration of readers, very good intra-reader reliability, good inter-reader reliability and high sensitivity to change in OMERACT RAMRIS can be achieved.11 The close correlation with erosion volumes determined by MRI and CT provides further evidence for the OMERACT RAMRIS erosion score as a valid measure of bone destruction. In conclusion, this study, aiming to compare bone erosion scores and quantitative measures of erosions in RA MCP joints on CT and MR images, demonstrated very high intramodality and high intermodality agreement. This applied both to single and total erosion volume. The high reproducibility of this quantitative method for assessing bone erosions makes it potentially valuable in longitudinal studies, including randomised controlled trials, of patients with RA as an outcome measure of structural joint damage. However, further studies, including studies of sensitivity to change, are needed to clarify this. The OMERACT RAMRIS erosion scores were closely correlated with erosion volumes, strongly supporting the OMERACT RAMRIS erosion score as a valid measure of joint destruction in RA. We thank the Danish Rheumatism Association and Copenhagen University Hospital at Hvidovre for financial support and photographer Ms. Susanne Østergaard for photographic assistance.
. Computerized measurement of magnetic resonance imaging erosion volumes in patients with rheumatoid arthritis: a comparison with existing magnetic resonance imaging scoring systems and standard clinical outcome measures. Arthritis Rheum 2003;48:614–24.
. OMERACT Rheumatoid Arthritis Magnetic Resonance Imaging Studies. Exercise 5: an international multicenter reliability study using computerized MRI erosion volume measurements. J Rheumatol 2003;30:1380–4.
. 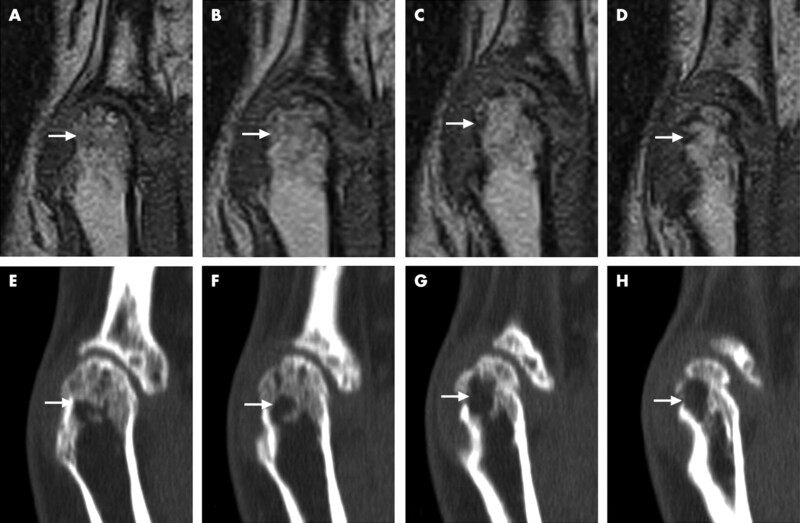 Magnetic resonance imaging in the evaluation of bone damage in rheumatoid arthritis: a more precise image or just a more expensive one? Arthritis Rheum 2003;48:585–9.
. The EULAR-OMERACT rheumatoid arthritis MRI reference image atlas: the metacarpophalangeal joints. Ann Rheum Dis, 2005;64(Suppl 1)i11–i21.
. OMERACT Rheumatoid Arthritis Magnetic Resonance Imaging Studies. Exercise 3: an international multicenter reliability study using the RA-MRI Score. J Rheumatol 2003;30:1366–75.
. OMERACT Rheumatoid Arthritis Magnetic Resonance Imaging Studies. Exercise 4: an international multicenter longitudinal study using the RA-MRI Score. J Rheumatol 2003;30:1376–9.
. Reliability and sensitivity to change of the OMERACT rheumatoid arthritis MRI score (RAMRIS) in a multi-reader longitudinal setting. Arthritis Rheum 2005;52:3860–7.
. Arthritis of the finger joints: a comprehensive approach comparing conventional radiography, scintigraphy, ultrasound, and contrast-enhanced magnetic resonance imaging. Arthritis Rheum 1999;42:1232–45.
. Conventional radiography requires a MRI-estimated bone volume loss of 20% to 30% to allow certain detection of bone erosions in rheumatoid arthritis metacarpophalangeal joints. Arthritis Res Ther 2006;8:R59.
. Magnetic resonance imaging of the wrist in early rheumatoid arthritis reveals a high prevalence of erosion at four months after symptom onset. Ann Rheum Dis 1998;57:350–6.
. Magnetic resonance imaging, radiography, and scintigraphy of the finger joints: one year follow up of patients with early arthritis. The TIRA Group. Ann Rheum Dis 2000;59:521–8.